Ex Demo model with 6 Month Return-Base Warranty that has been lightly used in a show room environment. 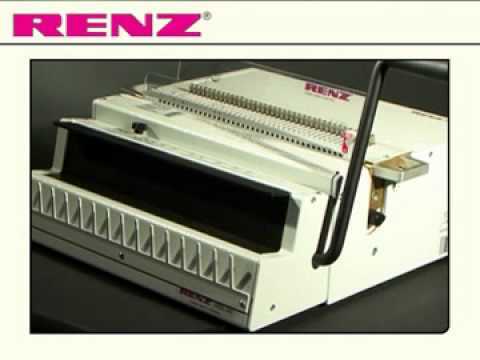 The RENZ DTP 340 M is a heavy duty Desktop Electric Punching Machine. High performance punching system for punching paper with operating width of up to 34 cm (13,5"). Simple operation thanks to its foot pedal and vertical paper feed. The DTP 340M is highly versatile with interchangeable tools and optimum paper format adjustment. All punching tools are delivered with punching pins which can be deselected. MBS (Module Binding System) is a modular expandable binding system for RENZ Ring Wire® wire comb, plastic comb and coil binding and all MBS modules can be attached to the DTP 340 M, for a high-performance compact binding system or they can be used on their own as a binding machine. Modules for inserting or closing wire comb, plastic comb and coil binding can be attached. Quick interchangeable units with a simple attachment system. All modules can be attached in seconds, thanks to a simple attachment system. The binding capacity of the DTP340M with a MBS module is up to 400 blocks/h. Compact and requires little space. Well proven technology, made in Germany. Please note that this is a shell and requires one of the binding dies shown below to turn it into a binding system. Multiple dies can be purchased to create a multi-functional binding system.